Judge Michael Davis has granted the record label plaintiffs' unopposed motion for extension of time to respond to Jammie Thomas-Rasset's Motion for a New Trial, Remittitur, and to Alter or Amend the Judgment. Plaintiffs' opposition is now due August 12, and defendant's reply August 19. In view of the lack of courtesy by the RIAA lawyers, I am appalled and offended that defendant consented to the extension. Those following this case will recall that, when defendant's counsel sought to substitute new counsel just 3 1/2 weeks before the trial, the RIAA adamantly opposed granting any extension at all, just as they adamantly opposed granting defendant the courtesy of an extension in which to file her expert report. Although courtesies of this nature are routine when dealing with normal lawyers, the RIAA lawyers behave like vicious dogs rather than lawyers, and should be treated as such. Defendants' counsel's agreement to this extension is an obscenity. When Thomas-Rasset's former attorney Brian Toder moved to have new counsel substitute in, less than a month before trial, he represented that there would be no continuance. And the reason was simple: there was a good chance that the court would not grant the motion if a continuance would be necessary. How do we know that? Because the court had already rejected a previous effort by Toder to withdraw before the first trial, in part because trial was "barely a month away" (see page 6). As for the plaintiffs' refusal to grant the request for an extension on the expert report, the timeline is a bit convoluted, but it the evidence is clear that: 1) the new expert (necessitated because the first exposed Thomas-Rasset's falsehood about her hard drive) had been named two years after the expert discovery cutoff, and 2) defense counsel dawdled even after the court ordered the deadline he asked for. A refusal to grant the requested 2-week extension was entirely justified under such circumstances. Beckerman even attacks Thomas-Rasset's defense counsel for failing to oppose the extension, calling their agreement to the plaintiffs' request "an obscenity" (!). But defense counsel had a perfectly good reason to agree (aside from the fact that there was no reason not to): they are involved in the defense of Joel Tenenbaum, whose trial is set to begin in less than two weeks, and presumably have no more interest than plaintiffs' counsel in dealing with both cases simultaneously. well ray, vicious dogs get shot, get they not? And since I assume you agree with me that the RIAA lawyers (unfortunately) can't be shot like those dogs I guess being extra nice and professional like the defendants lawyers were here in agreeing to the extension is the right way to deal with the RIAA-"lawyers"! 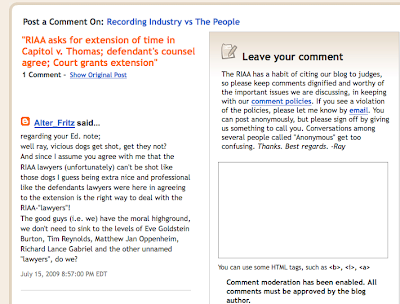 Note that Beckerman moderates comments and demands that submissions do "[n]othing to detract from the dignity of 'Recording Industry vs. The People' as a forum for the discussion of very important issues." Premable: "A lawyer should demonstrate respect for the legal system and for those who serve it, including judges, other lawyers and public officials." Rule 8.4: "It is professional misconduct for a lawyer to...engage in conduct involving...misrepresentation." Given his constant, vitriolic attacks, I'm not the least surprised that his behavior conforms to his words leading to him being slapped with a motion for sanctions in UMG v. Lindor.